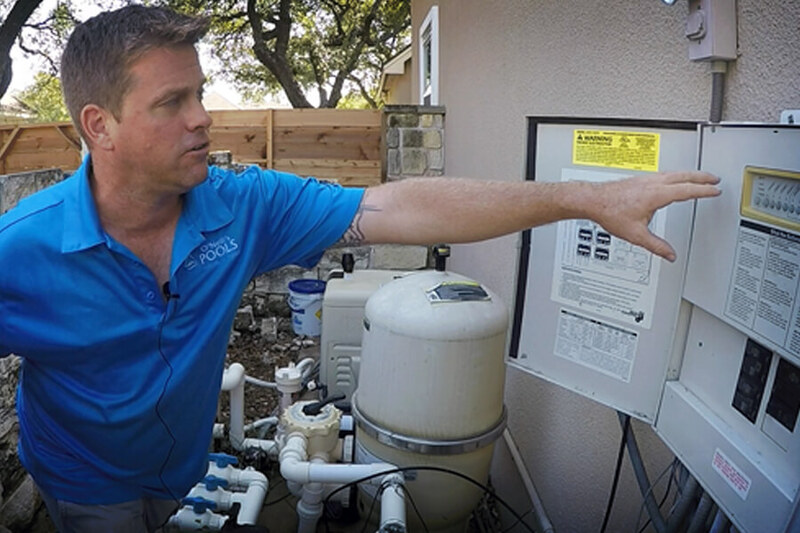 A pool’s filter system does the work to keeping the water clean, but it takes chemistry to do the fine-tuning. It’s important to carefully manipulate the chemical balance in pools for several reasons. One reason is that pathogens, such as bacteria, thrive in water. A pool filled with untreated water would be a perfect place for disease-carrying microorganisms to move from one person to another. Also, water with the wrong chemical balance can damage the various parts of the pool. In addition, improperly balanced water can irritate the skin and eyes. Improperly balanced water can also get very cloudy. There are several different chemicals that are recommended and required for pool maintenance. 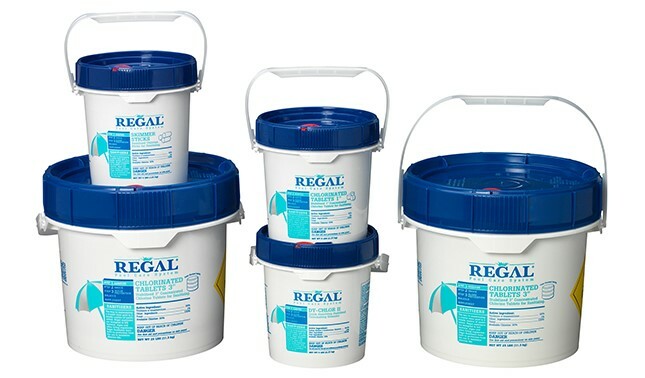 PoolStyle, Regal, Pool Logic, EZ Clor, and Pool Season all provide chemicals to keep your pool water safe and clear. Chlorine is a very widely used chemical – in fact it’s the most common chemical used for swimming pool sanitizing. The reason for this is that it’s very effective at killing contaminants and yet is easy and inexpensive to use. Swimming pool chlorine reacts with the pool water to produce hydrochloric acid and hypochlorous acid. Hypochlorous acid is chlorine’s active form and is able to penetrate the cell walls of bacteria and other potentially harmful microorganisms, killing them so they no longer pose a risk to the health of swimmers. 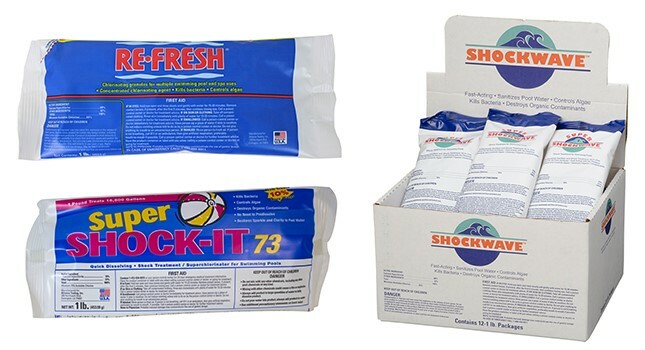 While pool chlorine is used for regular, ongoing sanitizing, it can also be used for pool shock treatments. “Shocking” or super-chlorinating a swimming pool refers to raising the chlorine levels until they are ten times the level of the chloramines in the water. Chlorine shock treatments are used during pool openings and whenever extra sanitization is required during the course of the swim season. Pool owners should shock their pool a minimum of every two weeks, especially when their pool is frequently used by a high number of swimmers. Although swimming pool chlorine is the most widely used pool sanitizer, pool bromine is also used. Swimming pool bromine is a highly effective sanitizer, which keeps water clean by killing microorganisms and by combining with and controlling debris in a similar fashion to chlorine. The chlorine tablets or granular chlorine that you constantly dissolve into your pool water seeks out and combines with bacteria and other organics on a molecular level, to neutralize these harmful contaminants. In the process of killing these harmful contaminants the chlorine becomes inactive, and the chlorine and bacteria that have combined together is called “Combined Chlorine”. The combined chlorine must be removed from the swimming pool to keep your pool water safe and clean. The combined chlorine is removed by “Shocking” the swimming pool. Super chlorinating or “Shocking” means drastically raising the chlorine level of the swimming pool for a short time, to a high enough level that the combined chlorine is burned up. Algae blooms cause problems for many swimming pool owners. While lack of proper circulation and out-of-balance water chemistry can lead to the growth of algae in pools, even carefully maintained swimming pools can sometimes experience algae growth. This is because algae spores can be carried into the water by the wind and by swimmers. Once algae blooms take root in your pool, they can become unsightly and can clog your pool’s filter. As a result, it’s important to use an effective treatment as soon as an algae bloom appears in your pool and it’s also a good idea to take measures to prevent algae from growing in your pool in the first place. Algaecides reduce the need for pool shock treatments and are safe for a variety of pool surfaces. 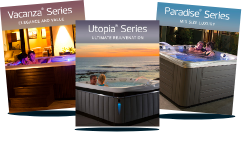 Swimming pool algaecides can take your pool from cloudy to crystal clear in less than 24 hours. Cloudy pool water is unsightly and unpleasant to swim in. It is also potentially dangerous as cloudy water can be home to bacteria and viruses that can cause illnesses and infections. Cloudy swimming pools can also be unsafe as the decreased visibility makes it harder to see if swimmers are struggling or in trouble under the water. Consequently, it’s extremely important to keep your pool water clean and clear by using pool clarifiers and pool cleaning chemicals.Swimming pool clarifiers allow you to take your pool water from cloudy to crystal clear quickly and easily. Clarifiers work by causing fine debris particles to coagulate into larger particles which can then be removed from the pool water through the pool’s filtration system. The idea of not having to add chlorine to the pool for a couple of weeks is very appealing to many people. Pool chlorinators or chemical feeders are fairly simple devices that hold larger amounts of chlorine or bromine and gradually release these chemicals into the pool. Swimming pool chemical feeders were invented so that pool owners would have a reliable, convenient method for administering the correct amount of chlorine to their pools with less effort. 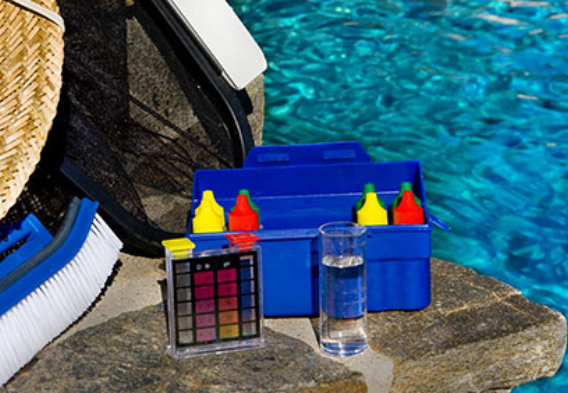 Pool chlorinators also ensure that your pool water is chemically balanced. Ask us about the different types of chemical feeders!